Are you sick of Wechat? Do you have no use for it and are ready to let go of social media? Maybe you're fine with staying connected, but are on the hunt for a better social media app that can suit your needs. At any rate, one way to clear some room on your phone and get it ready for the next app is to delete WeChat account permanently. Of course, deleting the app won't get rid of your account itself; there's more to it than that. Why Would You Want to Permanently Delete WeChat? The WeChat app takes up too much room. Not every user has a lot of space on their phone, and they might find that they want to free up some of their limited space. The user is concerned about privacy. Social media apps are basically the opposite of privacy. If you no longer want private data lurking on your phone, deleting these apps might help. The user no longer wants to use WeChat. Many times new and better apps come along that perform the same function, and this might be the case with you. Unfortunately, if you don't delete your WeChat account, and simply leave it unused, this can still present a privacy risk. Your information will still be on social media, people will still try to contact you, and your account and all its information could be subjected to hacking. This is why permanently deleting your WeChat account is the best option if you never want to use WeChat again. How Can I Delete My WeChat Account Permanently? Now, this may seem as easy as going into your settings and manually deleting it, but that's not going to permanently delete your data. Yes, you won't be able to see it anymore, but the data is actually still on your phone and is recoverable. That's why it's advisable to use a third-party application that actually permanently deletes your private WeChat data. A great application to use for exactly these purposes is the iMyFone Umate Pro. 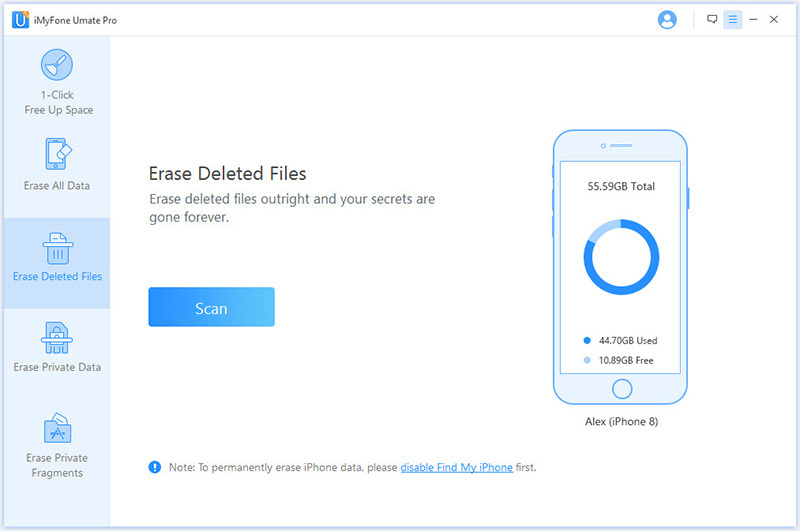 It is the first one and the only one iOS data eraser which supports to permanently delete WeChat chat history, without zero chance of recovery. You can delete private data, delete junk files, and even permanently delete files that you already “deleted” manually, so that your WeChat history is 100% unrecoverable. Preview and completely delete the selected WeChat message, photos, videos, document files, etc. without any chance of recovery. 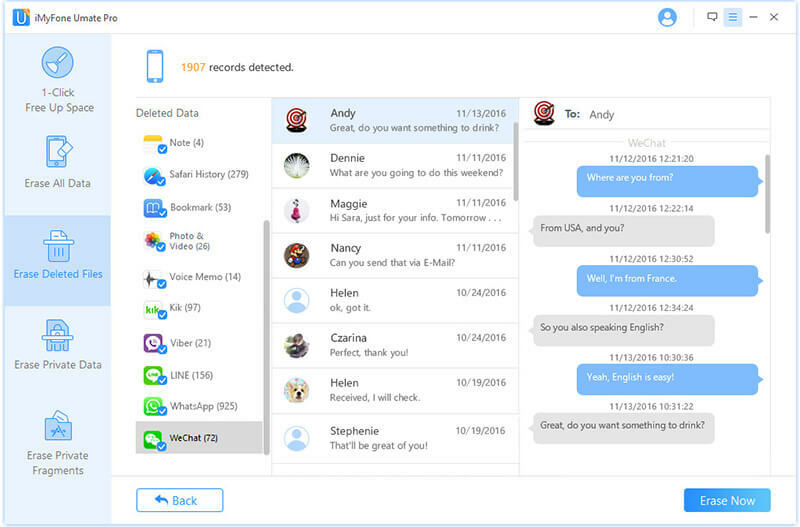 WeChat messages or chats you manually deleted can be scanned and fully destroyed even from device drive, leaving no traces of recovery. Any private traces left by WeChat will be permanently removed. Don't let yourself in any risk of privack leak. Support multiple WeChat accounts, which means it shows you all the WeChat accounts which signed in on this iPhone, including the ones you forgot. You can erase history from different WeChat accounts at once. (1) Run iMyFone Umate Pro on your PC or Mac and connect your device. (2) Click on either “Erase Private Data” or “Erase Deleted Files” tab. You could also go through both of these in turn. Hit “Scan” button. (3) Select unwanted WeChat data and hit “Erase Now” button. Confirm the deletion. This will permanently remove all of the files from your device. This means that they will be unrecoverable even if someone used software to try to recover them. As you can see, if you're concerned about privacy, then the iMyFone Umate Pro application is extremely useful in protecting you. Chances are, you use some kind of third-party services with WeChat. WeChat is an open platform that allows developers to offer other functionalities, but since you won't need these anymore after getting rid of your WeChat account, you will probably want to delete these. Think about any e-commerce apps or payment processors that you use with WeChat. Make sure that you delete private information from these services, too. The iMyFone Umate Pro should take care of the private files that these services leave behind on your iPhone. To finish deleting WeChat account permanently, you're going to have to drop WeChat a line. E-mail their support about your intention to permanently stop using the service and they should be able to delete your account. You can contact WeChat support via their Contact Us page. Keep in mind that this is not the same as just deleting the app off your phone. To really get rid of your account so that it is not merely sitting there abandoned and is actually genuinely deleted, you will have to get into contact with WeChat and there's no way around this. Once they delete your account, though, it's over and you won't be able to log on as you did before. Follow these steps and you can say goodbye to your WeChat account for good. Just make sure to get rid of all of your private information first with an app like iMyFone Umate Pro.